In addition to the popular areas right next to the Horseshoe Falls and Clifton Hill, the Fallsview area has become an important tourist destination in Niagara Falls, Ontario. One of the main attractions here is the Niagara Fallsview Casino Resort, a $1 billion hotel, gambling and entertainment complex that was opened in 2004. It now houses a casino with more than 200,000 square feet or 19,000 square meters of floor area, more than 100 gaming tables and over 3000 slot machines. 374 hotel rooms provide upscale accommodation; 18 restaurants keep guests well fed, and one nightclub and even a wedding chapel cater to the guests’ needs. More than 30 shops are located in the Galleria Shopping Centre inside this huge complex. Other major hotels in the Fallsview Tourist Area include the Hilton Hotel and Suites Niagara Falls, Fallsview, the Four Points by Sheraton Niagara Falls Fallsview, The Oakes Hotel, Embassy Suites, the Radisson Hotel & Suites Fallsview, the Marriott Gateway on the Falls Hotel and the Niagara Falls Marriott Gateway on the Falls. All of these hotel complexes feature popular restaurants, many of which boast a panoramic view over the Horseshoe Falls. Other attractions in the area include the Skylon Tower, an observation tower that opened in 1965. 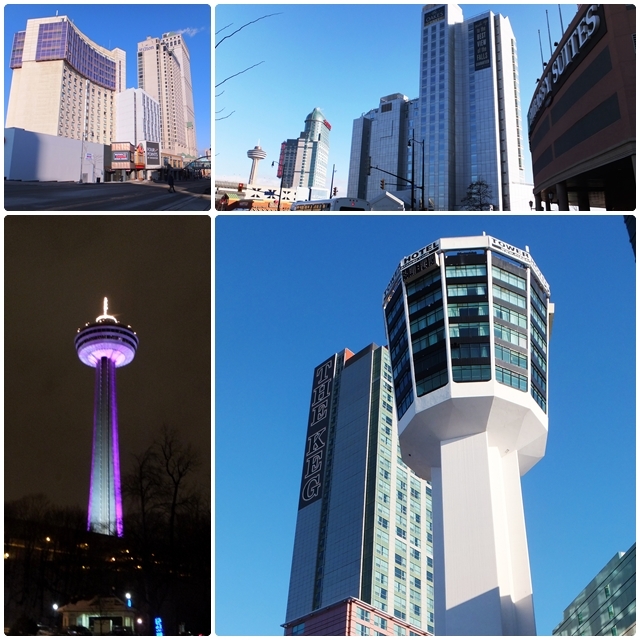 Today, the Skylon Tower features two restaurants: the Revolving Dining Room 236 metres or 775 feet above the Falls, and the upper Summit Suite Buffet. The Konica Minolta Tower was opened in 1962 and today is home to the Tower Hotel which, after extensive recent renovations, is now a 4-star boutique hotel. Not far from this hotel is the upper station of the Niagara Falls Funicular which connects the Fallsview area with the Table Rock Complex next to the Horseshoe Falls. The Fallsview area has many highrise tower hotels. Numerous smaller hotels are located along Fallsview Boulevard. Most of them are chain hotels while the Old Stone Inn is a historic boutique hotel that is located in an old flour mill from the early 1900s. Inexpensive small hotels and motels are located throughout Niagara Falls, particularly on the Lundy’s Lane Motel Strip. 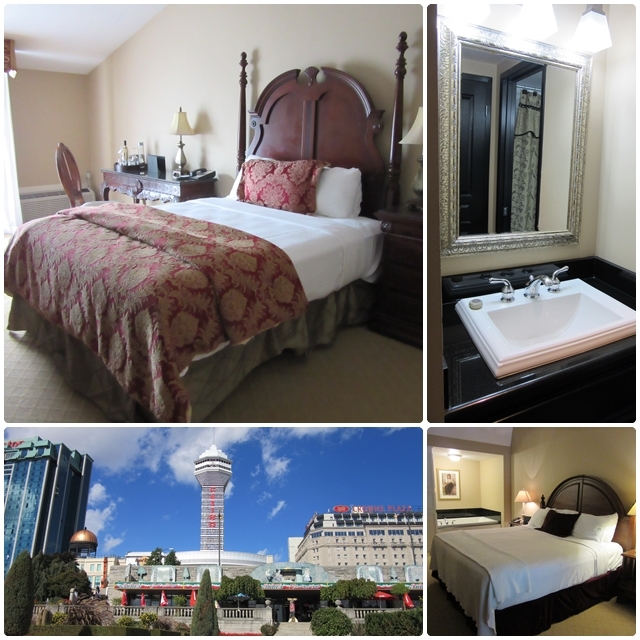 The Clifton Hill Tourist Area also has numerous accommodation options, including the Sheraton on the Falls Hotel and the historic Crown Plaza Niagara Falls Fallsview Hotel. Budget-conscious travellers will also find three hostels in Niagara Falls that offer private and shared rooms. Among the most popular accommodation options in Niagara Falls are privately owned bed and breakfasts. Many of them are located in historic houses and mansions, often along the scenic Niagara Parkway. Other accommodation options also include campgrounds and cottages. A number of the Niagara Falls hotels also provide indoor waterparks such as Great Wolf Lodge, the Americana Resort or the Sheraton on the Falls Hotel. In addition to the mighty cascades, Niagara Falls has several tourist attractions that have been drawing big crowds for many years. Among those are places such as Bird Kingdom, an indoor aviary with more than 300 individual birds that also showcases mammals, insects and reptiles. The Maid of the Mist is one of Niagara Falls’ most popular attractions and started as a ferry service between Niagara Falls, Ontario, and Niagara Falls, New York, in 1846. This sightseeing boat tour takes visitors all the way into the dense mist of the area immediately adjacent to the Horseshoe Falls. In 1960, the Maid of the Mist was responsible for the rescue of Roger Woodward, a 7 year old boy and the first person to survive a plunge over the Horseshoe Falls, wearing only a life jacket. The IMAX Theatre next to the Skylon Tower has a museum that is dedicated to the daredevils that crossed the Horseshoe Falls and features original barrels that were used in various crazy plunges. 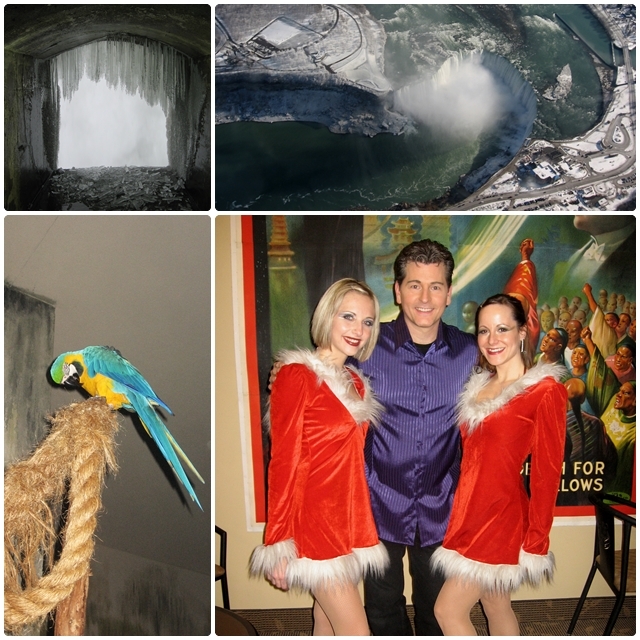 Niagara Falls, Ontario, also has some popular entertainment options such as the Greg Frewin Dinner Theatre, which presents a Las Vegas-style magic show, and Oh Canada Eh?, a long running dinner show that provides entertainment with a humorous and uniquely Canadian slant. A more recent addition to Niagara Falls’ entertainment lineup is the Escape Room Niagara Falls, an interactive puzzle filled environment that challenges participants to come up with creative ways to get out of a locked room. 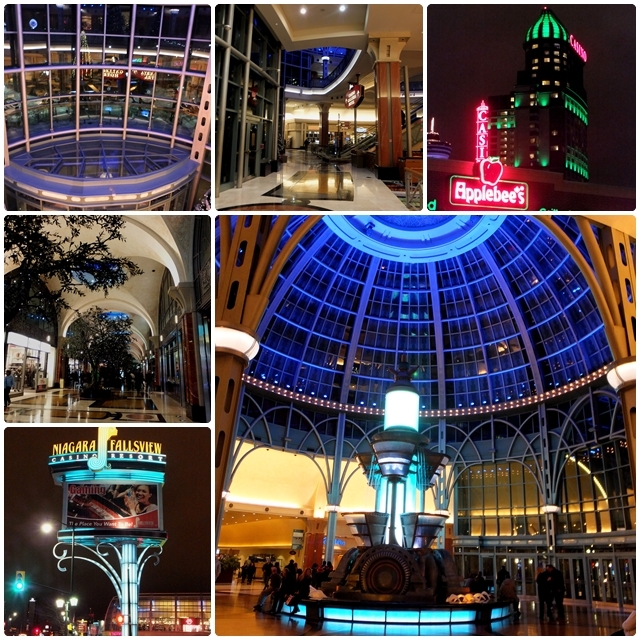 In our third article about Niagara Falls, Ontario, we will feature some of the less well known and less touristy attractions of this popular destination.